Food photography has long been a crowd-pleaser. 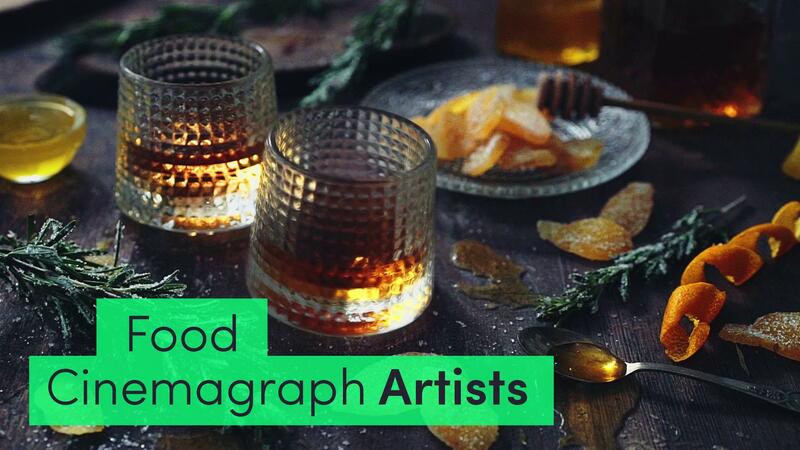 Now the genre is taking off in a new direction thanks to cinemagraphs, an exciting visual medium bringing food photos to life. To give you a taste of the finer points of creating food cinemagraphs, we asked gallereplay artists Daria Khoroshavina, Peter Chou, and Olena Balatska to share their recipe for success. gallereplay: What initially compelled you to start making food cinemagraphs? What excites you about them? gallereplay: Is there anything especially important to consider in terms of styling and composition when creating food cinemagraphs? Peter Chou: “Once you have the composition, it’s a matter of determining the elements to be used in creating the movement for the cinemagraph. Popular elements used in food cinemagraphs are liquids that are poured, dripping or swirling; steam is also popular. The benefit of a cinemagraph over a still image is how the viewer is drawn into the image. Daria Khoroshavina: “Well, you need to keep in mind that it’s a video and not everything can be retouched, and it usually takes longer to shoot, so it’s more difficult to keep the food looking good in the frame . . . Everything else is the same as with food photography, all the same tricks: toothpicks everywhere, every water/oil/juice drop is strategically placed with a brush, and every food piece is treated like a moody supermodel. gallereplay: Do you use any special equipment in your work? Are there any aspects of post-processing that are essential to producing a high-quality cinemagraph? Olena Balatska: “For shooting I use a camera, a tripod, and lighting. For post-processing my favorite programs are After Effects and Photoshop. I’m working on the technique for each frame, as they all are different and each requires a special approach for processing. gallereplay: Could you tell us about a current or upcoming project that you’re excited about? Is there any place you would love to have your work featured, or any brands/companies you’d be excited to work with? To see more mouthwatering food cinemagraphs from the aforementioned artists, check out their gallereplay pages here: Kitchen Ghosts, Peter Chou, and Olena Balatska.